What does your program do? Answering this seemingly simple question is where the program evaluation planning process always starts. To measure something, you first have to define it. When you apply an evaluative lens to a program, a new way of thinking about it emerges. Take for example the work I recently completed with the Northwest Housing Alternatives (NHA) Resident Services Program. The project goal was was simple: to improve how the team communicated with potential funders about the positive impact of their work in order to increase their chances for grant funding. At the end of our 6-month project together, not only did the final concept paper lead to the NHA Resident Services Program securing two of their largest grants to date, but the process helped their staff develop the confidence and skills to gather data that’s relevant to their work AND to put that data to use to continually improve their programs. 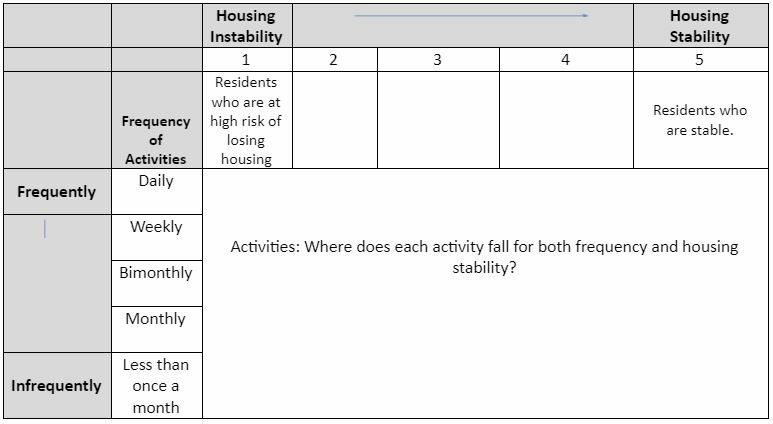 My evaluative brain was churning – How do these services promote housing stability? What are these services? How frequently did they occur? How did they decide what activities to implement? They determined what activities to implement based on resident requests, their own observations of need, and/or in agreement with the property manager. Next was Phase 2, which focused on group work. We all gathered for an evaluation planning session to dive deeper to answer the big question: what does this program do? I translated the concepts that we discussed in this activity into the program evaluation plan. 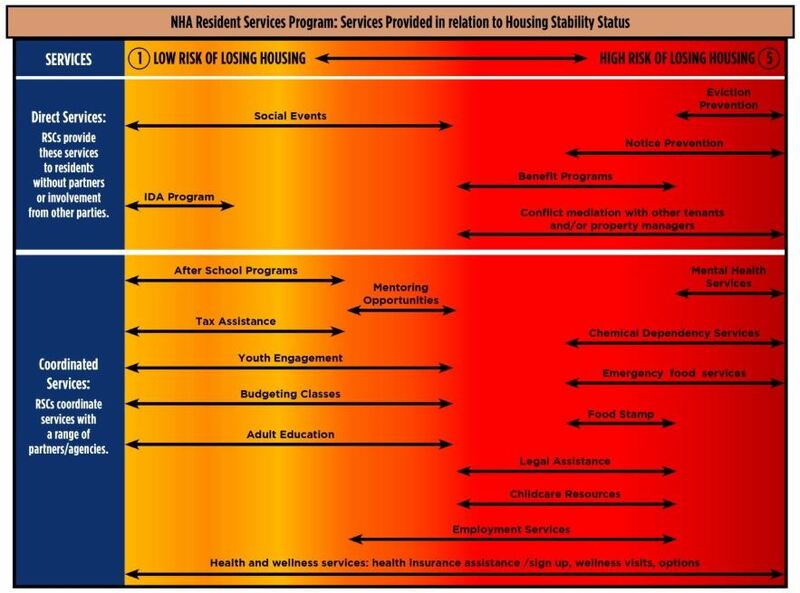 The figure below depicts the relationship between housing stability and the service activities that we identified during our work together. When I presented this service map to them, the team commented on how clearly this table described the way the team thought about their own work. It also identified areas in which the current systems could be improved, and because of that, the team implemented a new tracking system to better understand how staff can use data to efficiently manage their time and determine what activities would be most useful. 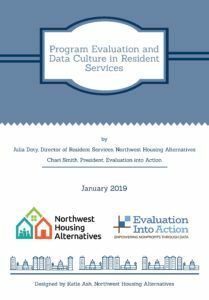 Ultimately, what was most significant for the NHA Resident Services Program team’s experience going through the evaluation process was how they saw their work in a new way. The process helped them try new ways to answer the big questions about what their program does and why. It helped them uncover ways to improve and streamline their work to strengthen their program’s impact. Finally, it gave them a new way to more clearly and succinctly communicate how they approach their work to outside funders. Interested in learning more about how you and your team can benefit from program evaluation at your organization? Want to improve how you communicate the impact of your work to potential funders? Feel free to email me anytime – I’d love to help! Chari accurately captured the fundamental goals and mission of our organization and transformed our input into a clear evaluation process that helps us assess the impact of our programs on the lives of the families that we serve. Now we have an amazing way to measure the physical, emotional, and mental effects of our programs and to guide change, ensuring that we are delivering services in the most effective way possible.